The author&#146;s helpful blend of industry expertise and academic discipline shine through in this accessible and significant study. Justin Wyatt, a former film market research analyst and now a film scholar, has also written important articles on film marketing for Sight and Sound, and he is an acknowledged expert in the fledgling research field of film marketing. The Series Editor of the Texas Film and Media Studies series of which this book forms a contribution, Thomas Schatz, has published important work on Hollywood genre and his influence on Wyatt&#146;s work is evident. Wyatt&#146;s book paints a vivid but never censorious picture of the commercial imperative driving Hollywood and creates a convincing teleology in which it becomes clear why Superman and Ghostbusters were high concept in a way that Gone with the Wind and Casablanca were not. Some rather obvious points are perhaps over-emphasized; that high concept is driven by the profit motive and that it frequently places style over substance do not require frequent reiteration. Still, Wyatt&#146;s thesis is persuasive and he is sufficiently judicious to record anomalies in the trends he charts. His generalization, for example, that high concept movies are driven by marketing campaigns which focus on a single striking image grates, but Wyatt acknowledges exceptions such as Innerspace that prove his rule. Despite the undeniable prevalence of an ethos of high concept, citing films which perfectly conform to the model is surprisingly difficult, and the same slick Don Simpson and Jerry Bruckheimer productions, Flashdance and Top Gun, do tend to be summoned as evidence time and again. Interestingly Bruckheimer is credited in the acknowledgements, and this book also shares part of its title with the notorious account of Don Simpson&#146;s life by Charles Fleming, High Concept: Don Simpson and the Hollywood Culture of Excess. What that book possesses in engaging sleaze, this book complements with a lively investigation of the market conditions that enabled Simpson et. al. to colonize the 1980s U.S. box office and to fund their extreme leisure pursuits. It is also perhaps too easy for Wyatt to read certain blockbuster films as high concept after the event, when their ability to capture a wide audience&#146;s imagination is proven. Had they failed at the box office, the high concept qualities of, say, Ghost, Gladiator or Manhunter are not so easily distilled into a one-sentence marketing formula. 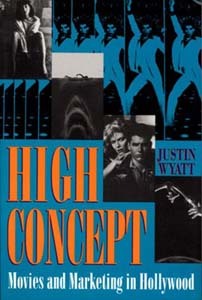 The latter film also raises the important question of whether status as a &#147;pre-sold&#148; concept, derived from a best-selling book, comic or TV show, is a sufficiently compelling reason to term a project &#147;high concept.&#148; As Wyatt indicates, this pre-sold quality must be teamed with commercial potential, but it is this which has only retrospective resonance. Perhaps inevitably the third chapter, recounting historical changes in the Hollywood marketplace, is the most pedestrian. Peter Biskind&#146;s compelling story of the 1960s and 1970s,Easy Riders, Raging Bulls is hard to match on the rise of the studio system that paved the way for the high concept movie, but Wyatt plausibly explains the necessity of granting a chapter to the topic, and there are stand-out paragraphs: his potted history of the rise of pay-cable television service HBO is quite fascinating. There are a few lapses in accuracy. For example, Wyatt terms the Prince song "When Doves Cry" ‘When The Doves Cry’ twice, including once when quoting from another source, but these are minute quibbles in a rigorously researched and edited book. Film marketing is a relatively new area of study even now. When Justin Wyatt first published his book in 1994, it was still less so. This is a well-illustrated, helpfully chapter-sectioned study with a detailed and logical index, useful for laymen and scholars alike. As film marketing burgeons as an academic discipline, this book will not only gain in significance in its own right but the story of the succeeding decade will also need to be told. Given the strength of this volume, it is to be hoped that Justin Wyatt himself will be publishing the sequel.